In order to make each hunter or group comfortable, we accommodate each group with their own cabin or private room. Each cabin has electricity, a full bathroom, a refrigerator, a cook stove, and a television. Each hunting day begins with breakfast around 8:00 a.m., and we depart for the hunt around 11:30, with a packed lunch. 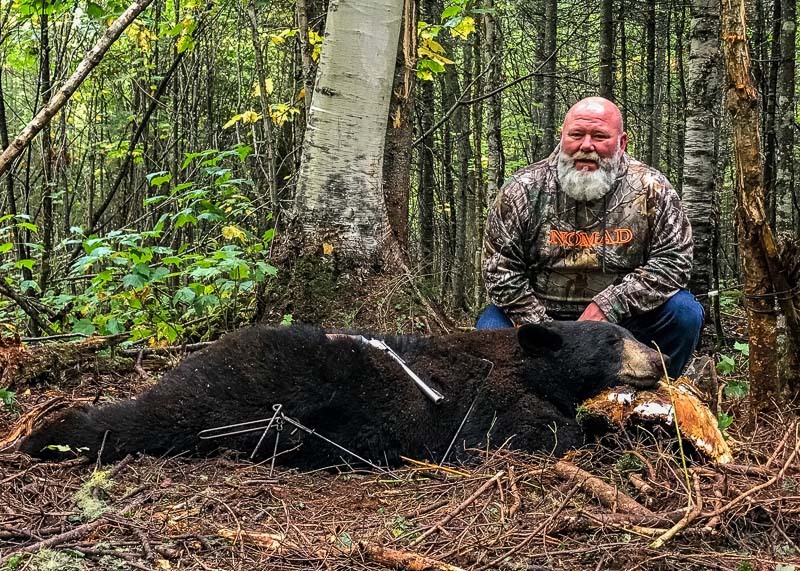 After lunch and checking other bear bait sites, we begin setting hunters in their stands around 2:30 and hunt until dark, approximately 8:00 or 9:00 p.m. Each morning successful hunters go to our photo location in the morning, to take high-quality photos of your trophy. There are many recreational activities to pass the morning hours prior to the hunt. Hunters who score early in the week can choose coyote hunting, fishing for muskie or brook trout, canoeing. 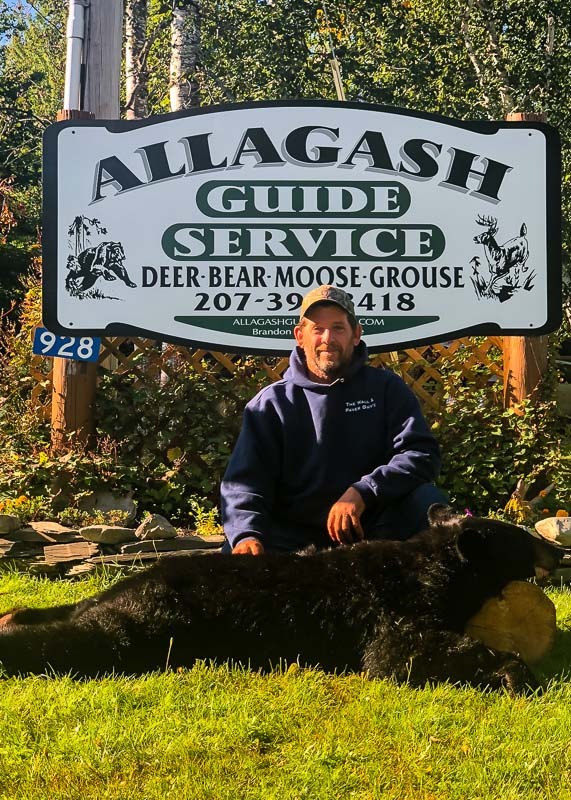 Moreover, many hunters enjoy photographing moose and the stunning scenery of Allagash. We designate two bait sites per hunter, assuring a high possibility of sightings and success. Due to our expansive territory and limited number of hunters over the course of a season, we hunt different regions each week. Not only do hunters get two sites per person, but also they are always fresh and undisturbed prior to your arrival; they are not leftover sites from a previous week. Our guides work closely together throughout the season, sharing information and notes trying to ensure that each hunter is successful. 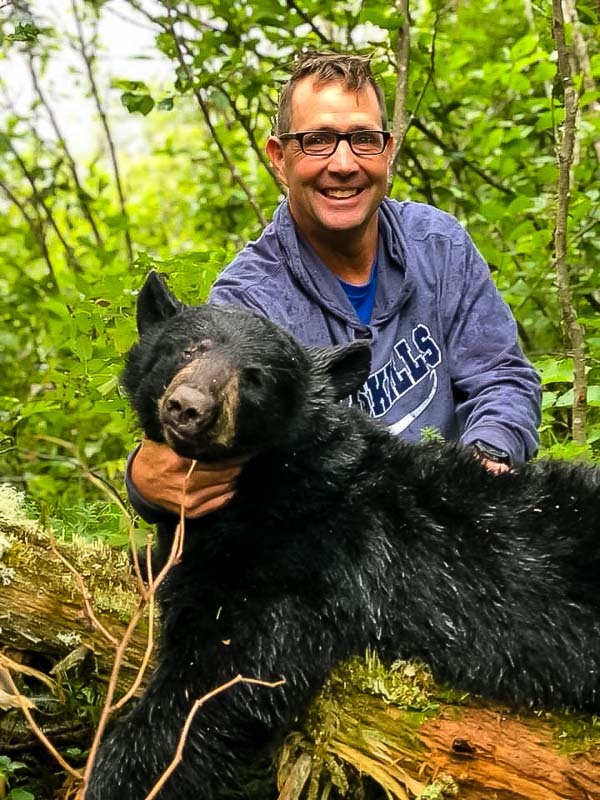 Success for harvesting a bear varies between 50 – 80% each year with 90 – 95% of hunters sighting a bear during their hunt. Tree stands and ground blinds are camouflaged to accommodate all hunting methods (bow, crossbow, rifle, handgun or blackpowder). Shooting distances range from 15 – 100 yards, due to the composition of the forest average shooting distances are 20 – 40 yards. State law allows for preseason baiting for 30 days in advance of the hunting season, we take advantage of the baiting season by checking sites and rebaiting at least once every three days. Trail cameras, preseason scouting, and frequent baiting help create a pattern of consistent activity, which will produce significant opportunities.